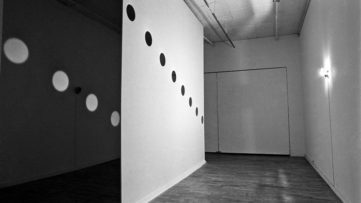 The 1960s brought a generation of artists which was bold enough to ignore the previous one, as well as to appropriate or, in better words, extend the early avant-garde legacy. The period is also characterized by the appearance of artistic duos e.g. artists who were professionally and emotionally entangled, and Christo and Jeanne-Claude are perhaps the best-known example. Despite the fact they decided to release the works under Christo’s name only, the creative process was based on equal decision making, planning and supervising of their large-scale wrapped projects in public space which were produced throughout the years. Christo and Jeanne-Claude managed to establish an authentic practice based on the mixture of sculpture, installation art, and architecture. A starting point for such an aesthetic can be traced back to Duchamp’s readymade, a concept which influenced several artists belonging to the movement of Nouveau Realisme including the artist duo. 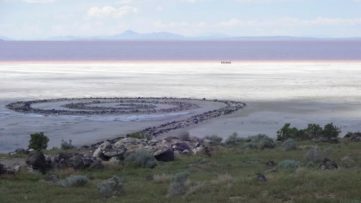 Their pieces have not only intrigued and inspired the movements such as Land Art, but they have also moved architectural circles in terms of articulation of the domains of spatiality and the use of public space. 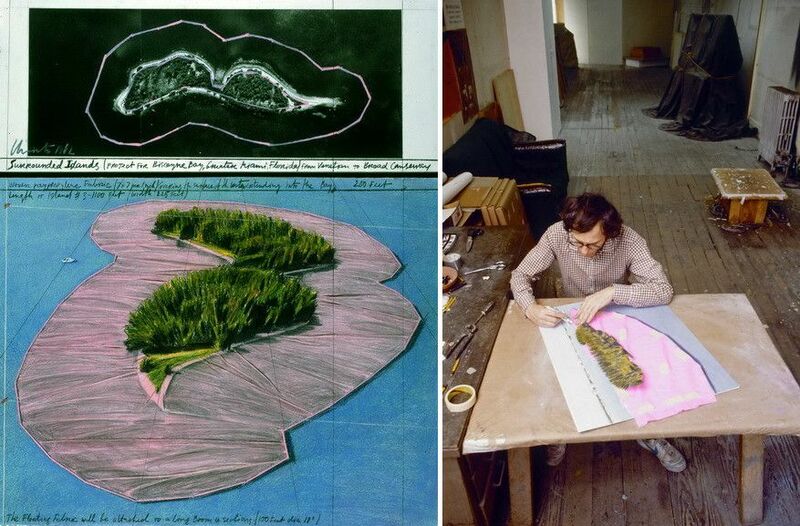 In order to rediscover one of their iconic pieces called Surrounded Islands from 1983, the Pérez Art Museum in Miami decided to organize a documentary exhibition of archival materials and artworks surrounding the process. Our projects have a dimension of urban planning, like building highways or bridges, and they are also similar in terms of the permitting process. Surrounded Islands is one of their most celebrated projects and it embodies really well all of the stated above. 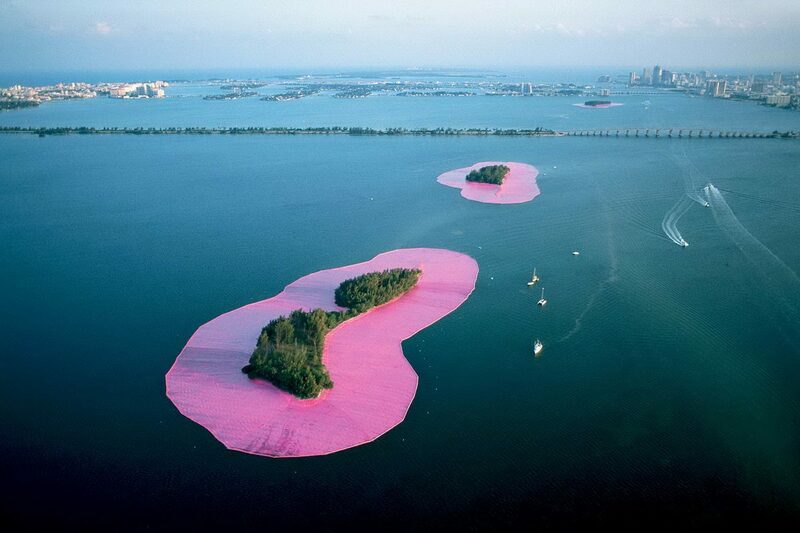 In 1983, the pair encircled eleven uninhabited islands in Miami’s Biscayne Bay with pink fabric. To be more precise, 6.5 million square feet of floating polypropylene material was used for that purpose and it was in sync with water, sky, and foliage, and installed by four hundred and thirty people. The achieved effect was an ephemeral composition in blue, green, pink, and turquoise; the shiny pink surface was in perfect contrast with the vegetation and the sun, as well as the water of Biscayne Bay. The installation was present for two weeks and was quite welcomed by the local community which enjoyed it from the land, the water, and the air, so Surrounded Islands undoubtedly became one of the milestones of the city’s cultural history. In order to release the project, the preparations started in 1981 by a team consisting of attorneys, a marine biologist, ornithologists, a mammal biologist, a marine engineer, consulting engineers, and a builder-contractor. The local services cleansed the islands of debris, and the permits were obtained by several governmental agencies. The process was quite complex, so at one point the earth anchors were driven into the land, covering the surface of the beach and disappearing under the vegetation. Surrounded Islands was tracked 24 hours by one hundred and twenty monitors located in inflatable boats. 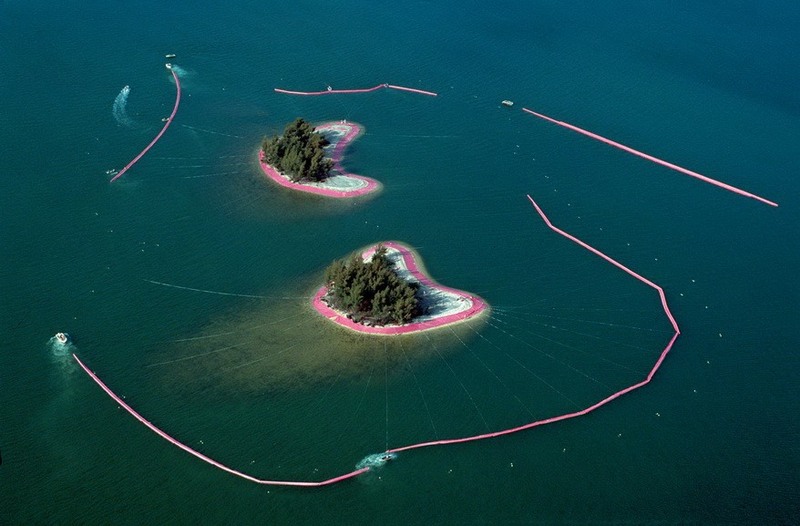 Out of the total number, two islands were surrounded with the fabric in order to form a particular entity. The project was entirely financed by the artists themselves, from the sale of the preparatory pastel and charcoal drawings, collages, lithographs, and early works. Finally, it would not be possible if there wasn’t for the huge ambition of Christo and Jeanne-Claude who patiently pursued their vision. Therefore, the upcoming exhibition should be perceived as a narrative of communal efforts and immense willpower. All of our projects are like expeditions. The story of each is unique. The Pérez Art Museum exhibition will include drawings, collages, photographs and other components of Surrounded Islands that provide a window into the project—from its conception to realization. Aside from just honoring the piece, the exhibition tends to function as a time capsule in order to revisit the cultural impact Surrounded Islands made on Miami; it largely helped the local community to realize their neighborhood could become a significant center for contemporary art. Furthermore, the project underlines the emancipatory potential of art in the sense of civic unity. 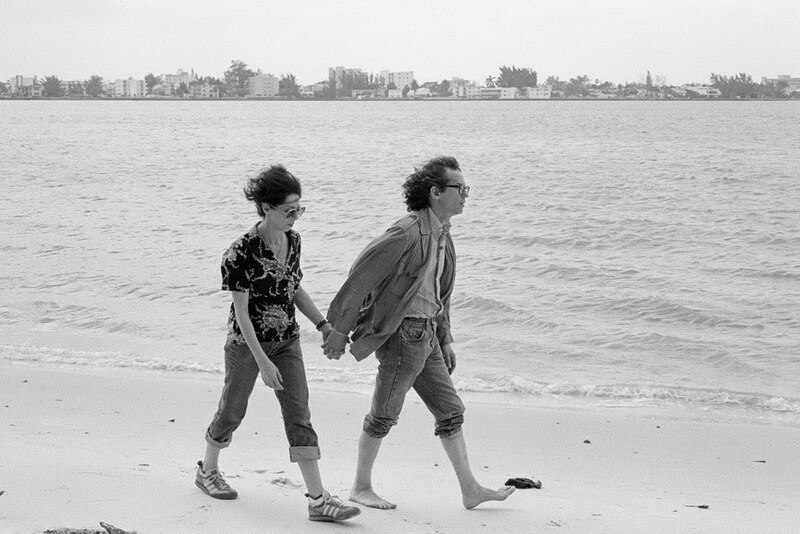 The exhibition will mark the 35th anniversary of the installation, as well as of the Center for Fine Arts which was the founding of PAMM’s predecessor institution. 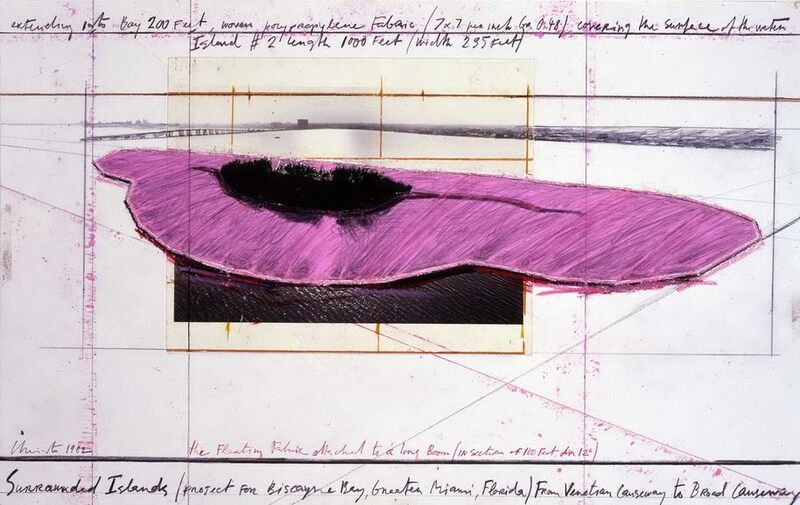 Christo and Jeanne-Claude: Surrounded Islands, Biscayne Bay, Greater Miami, Florida, 1980-83: A Documentary Exhibition will be on view at The Pérez Art Museum in Miami from 5 October 2018 until 17 February 2019. The work of the artist couple Christo (born 1935) and Jeanne-Claude (1935–2009) resists categorization. 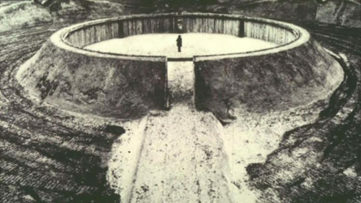 It is a hybrid of art, urban planning, architecture, and engineering, but above all an aesthetic uniquely their own: surreal and ethereal environmental interventions that have graced monuments, public parks, and centers of power alike. This compact book spans the complete career of the couple who were born on the very same day, met in Paris, fell in love, and became a creative team like no other. The book celebrates all of the couple’s most famous environmental interventions, such as The Gates in New York’s Central Park and the Wrapped Reichstag in Berlin, while also featuring early drawings and family photos unknown to the wider public.